The PACE mission will carry into space a spectrometer measuring at 5 nm resolution in the UV to NIR and at lower resolution in spectral bands in the NIR and SWIR and, eventually, a multispectral, multi-angle polarimeter measuring in the UV to SWIR. These instruments have great potential for improving estimates of marine reflectance in the post-EOS era. In view of this, the proposal objectives are as follows. The first objective is to evaluate, using the Bayesian approach to inverse problems, the gain in marine reflectance accuracy expected by 1) including observations in the UV and SWIR and 2) further including polarimetric and directional observations in selected spectral bands. This for the PACE threshold aggregate bands with respect to the standard MODIS set of bands used to generate ocean color products. The second objective is to assess, also in a Bayesian context, the utility of hyper-spectral information for improving atmospheric correction in the aggregate bands, and to quantify the accuracy of the atmospheric correction at 5 nm resolution for separating ocean constituents and characterizing phytoplankton communities. To achieve these objectives, the TOA signal measured by the PACE spectrometer and the eventual polarimeter will be simulated for a variety of realistic atmospheric and oceanic conditions. Typical prior distributions for the aerosol, water reflectance, and surface parameters, suitable for utilization at a global scale, will be used, as well as noise distributions. The noise will encapsulate all the sources of uncertainties in the radiative transfer (RT) modeling and include sensor noise. The inverse models will be constructed based on several considerations, i.e., computational cost, convenience to approximate the conditional covariance (a second order quantity), and detection of abnormal values (due to limitations of the forward model). Ways to improve performance by specifying prior distributions from independent information about regional and temporal variability (e.g., from output of numerical transport models) will be investigated, and practical implementation of the Bayesian methodology will be outlined for routine application. The investigation will provide a Bayesian methodology for atmospheric correction of the PACE spectrometer data. The methodology makes it possible to incorporate known constraints of the marine reflectance (i.e., correlation between components) and to account for the varied sources of uncertainty (i.e., measurement noise, RT modeling errors). Importantly, it allows the construction of reliable multi-dimensional confidence domains of the retrieved marine reflectance. Specifically, the mean and covariance of the posterior distribution are computed. These quantities provide, for each pixel, an estimate of the marine reflectance and a measure of its uncertainty. Situations for which observation and forward model are incompatible are also identified. Thus the methodology will offer the means to analyze and interpret PACE ocean-color imagery in view of confidence limits and model adequacy, on a pixel-by-pixel basis. 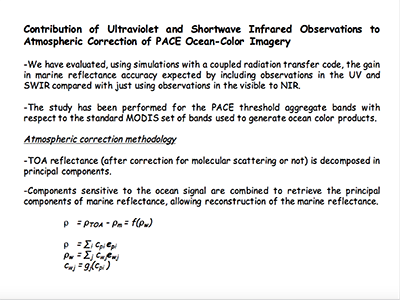 By evaluating via theoretical studies the accuracy of the atmospheric correction of PACE ocean-color radiometry and the expected improvements with respect to current ocean color sensors, by identifying optimum sets of spectral bands, and by providing an inverse methodology adapted to the problem, which can be viewed as a generalization of the standard algorithm, the investigation responds directly to the PACE Science Team Announcement of Opportunity, which seeks methods and approaches that will maximize the new capabilities of the PACE mission for understanding global ocean ecology in a changing climate. Frouin, R. and Pelletier, B. (2015). 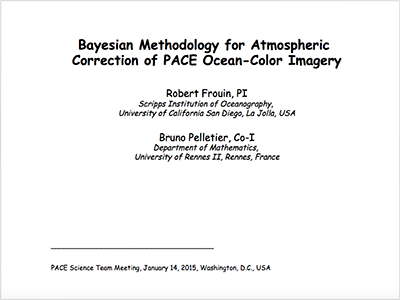 Bayesian Methodology for Inverting Satellite Ocean-color Data, Remote Sens. Environ., 159(15), 332-360, doi:10.1016/j.rse.2014.12.001. Frouin, R., Duforêt, L., and Steinmetz, F. (2014). Atmospheric Correction of Satellite Ocean-color Imagery in the Presence of Semi-transparent Clouds, Proc. SPIE, 9261, 926108, doi: 10.1117/12.2074008. Frouin, R., Deschamps, P., Ramon, D., and Steinmetz, F. (2012). Improved Ocean-color Remote Sensing in the Arctic Using the POLYMER Algorithm, Proc. SPIE, 8525, 85201, doi: 10.1117/12.9812. Frouin, R. and Pelletier, B. (2010). A Statistical Model of Marine Reflectance, Proc. SPIE, 7858, 78580E, doi: 10.1117/12.870683. Frouin, R. and Pelletier, B. (2010). Statistical Inference in Remote Sensing of Ocean Color, Proc. SPIE, 7858, 785803, doi: 10.1117/12.870677. Dubuisson, P., Frouin, R., Dessailly, D., Duforêt, L., Léon, J., Voss, K., and Antoine, D. (2009). Estimating the Altitude of Aerosol Plumes Over the Ocean from Reflectance Ratio Measurements in the O2 A-band, Remote Sens. Environ., 113, 1899-1911, doi: 10.1016/j.rse.2009.04.018. Frouin, R. and Pelletier, B. (2009). Noise and Model Uncertainties in Ocean Color Remote Sensing, Proc. SPIE, 7459, 745905, doi: 10.1117/12.829794. Frouin, R. and Pelletier, B. (2009). 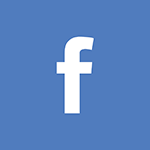 Consistency of Ridge Function Fields for Varying Nonparametric Regression, Communications in Statistics - Theory and Methods, 38(8), 1272-1283, doi: 10.1080/03610920802395702. Frouin, R., Deschamps, P., and Dubuisson, P. (2008). Remote Sensing of Solar-stimulated Phytoplankton Chlorophyll Fluorescence by Differential Absorption in the Oxygen B-band, Proc. SPIE, 7150, 715005, doi: 10.1117/12.806386. Frouin, R. and Pelletier, B. (2007). Fields of Non-linear Regression Models for Atmospheric Correction of Satellite Ocean-color Imagery, Remote Sens. Environ., 111(4), 450-465, doi:10.1016/j.rse.2007.04.005. Gross-Colzy, L., Colzy, S. Frouin, R., and Henry, P. (2007). 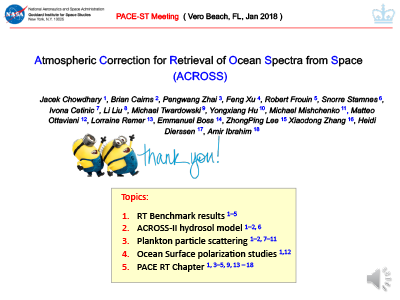 A General Ocean Color Atmospheric Correction Scheme Based on Principal Components Analysis - Part I: Performance on Case 1 and Case 2 Waters, Proc. SPIE, 6680, 668002, doi: 10.1117/12.738508. Frouin, R. and Pelletier, B. (2007). Constrained Linear Inversion of Satellite Ocean-color Data, Proc. SPIE, 6680, 668004, doi:10.1117/12.738690. Gross-Colzy, L., Colzy, S. Frouin, R., and Henry, P. (2007). A General Ocean Color Atmospheric Correction Scheme Based on Principal Components Analysis - Part II: Level 4 Merging Capabilities, Proc. SPIE, 6680, 668003, doi: 10.1117/12.738514. Duforêt, L., Frouin, R., and Dubuisson, P. (2007). Importance and Estimation of Aerosol Vertical Structure in Satellite Ocean-color Remote Sensing, Appl. Opt., 46(7), 1107-1119, doi: 10.1364/AO.46.001107. Frouin, R., Deschamps, P., Rothschild, R., Stephan, E., Leblanc, P., Duttweiler, F., Ghaemi, T., and Riedi, J. (2006). MAUVE/SWIPE: An Imaging Instrument Concept with Multi-angular, -spectral, and -polarized Capability for Remote Sensing of Aerosols, Ocean Color, Clouds, and Vegetation from Space, Proc. SPIE, 6406, 64060E, doi: 10.1117/12.698061. Frouin, R., Gross, L., and B. Pelletier, B. (2006). 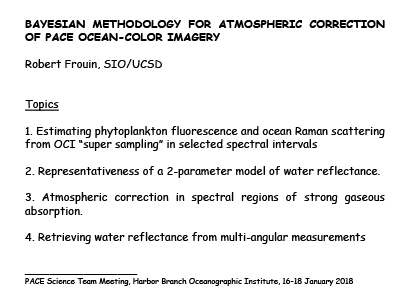 Progressive Atmospheric Correction of Satellite Ocean-color Imagery, Proc. SPIE 6406, 64061S, doi: 10.1117/12.698045. Dubuisson, P., Frouin, R., Duforêt, L., Dessailly, D., Voss, K.J., and Antoine, D. (2006). Estimation of Aerosol Altitude from Reflectance Ratio Measurements in the O2 A-band, Proc. SPIE, 6406, 640604, doi: 10.1117/12.697968. Frouin, R. and Pelletier, B. (2006). 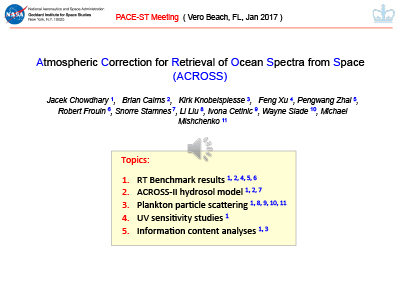 A Stochastic Technique for Remote Sensing of Ocean Color, Proc. SPIE, 6406, 640602, doi: 10.1117/12.6978. Frouin, R., Deschamps, P., Gross-Colzy, L., Murakami, H., and Nakajima, T. (2006). Retrieval of Chlorophyll-a Concentration via Linear Combination of ADEOS-II Global Imager Data, J. Oceanography, 62(7), 331-337, doi: 10.1007/s10872-006-0058-2. 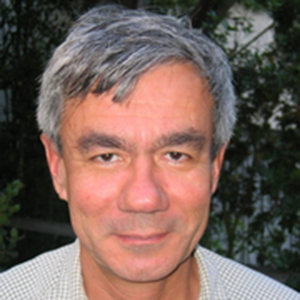 Pelletier, B. and Frouin, R. (2006). Remote Sensing of Phytoplankton Chlorophyll-a Concentration by Use of Ridge Function Fields, Appl. Opt., 45(4), 784-798, doi: 10.1364/AO.45.000784. Dubuisson, P., Dessailly, D., Vesperini, M., and Frouin, R. (2004). Water Vapor Retrieval over Ocean Using Near-infrared Radiometry, J. Geophys. Res., 109, D19106, doi:10.1029/2004JD004516. Pelletier, B. and Frouin, R. (2004). Fields of Nonlinear Regression Models for Inversion of Satellite Data, Geophys. Res. Lett., 31, L16304, doi:10.1029/2004GL019840. Gross-Colzy, L., and Frouin, R. (2003). Remote Sensing of Chlorophyll Concentration from Space via Principal Component Analysis of Atmospheric Effects, Proc. SPIE, 5155, 112, doi: 10.1117/12.512191. Gross, L., Frouin, R., Pietras, C., and Fargion, G. (2003). 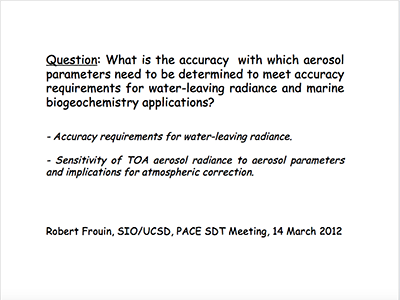 Non-supervised Classification of Aerosol Mixtures for Ocean Color Remote Sensing, Proc. SPIE, 4892, 95, doi: 10.1117/12.467305. Nicolas, J., Deschamps, P., and Frouin, R. (2001). Spectral Reflectance of Oceanic Whitecaps in the Visible and Near Infrared: Aircraft Measurements Over Open Ocean, Geophys. Res. Lett., 28(23), 4445-4448, doi: 10.1029/2001GL013556. Schwindling, M., Deschamps, P., and Frouin, R. (1998). Verification of Aerosol Models for Satellite Ocean Color Remote Sensing, J. Geophys. Res., 103(Cll), 24919-24935, doi: 10.1029/98JC02062. Frouin, R., Schwindling, M., and Deschamps, P. (1996). Spectral Reflectance of Sea Foam in the Visible and Near-infrared: In situ Measurements and Remote Sensing Implications, J. Geophys. Res., 101(C6), 14361-14371, doi: 10.1029/96JC00629. Frouin, R., Pouliquen, E., and Bréon, F.-M. (1994). 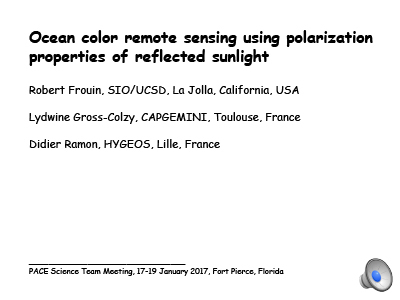 Ocean Color Remote Sensing Using Polarization Properties of Reflected Sunlight, Proceedings of the Sixth International Colloquium on "Physical Measurements and Signatures in Remote Sensing", Val d'Isère, France, 665-674.